Singapore news today | PAP GRASSROOT LEADER IS UNHAPPY WITH ALL THESE POLITICAL WAYANG? Prime Minister Lee Hsien Loong held a Q and A session with his fans on his Facebook page this morning. Not only we saw praises, complaints and feedbacks about his governance, we were surprised to see a PAP grassroot leader who is unhappy that public institutions have to spend time, effort and mobilised manpower to put up a "wayang" show for political leaders when they visit. Essentially, what the political leaders saw was a facade. Tay Xiong Sheng is a well-known Taekwondo instructor who holds a black belt (3rd dan) registered with the Singapore Taekwondo Federation. Apart from his role as an instructor, he is also a member of Woodlands Citizens’ Consultative Committee, an extension of People's Association that has close ties with the ruling People's Action Party. Tay shot to prominent in 2014 when he was invited as one of the guests in a CNA TV programme "Conversation with PM Lee". Tay's appearance on TV was spotted by sharp-eye netizens who realised that many of the guests in that programme were actively involved in PAP grassroot politics. 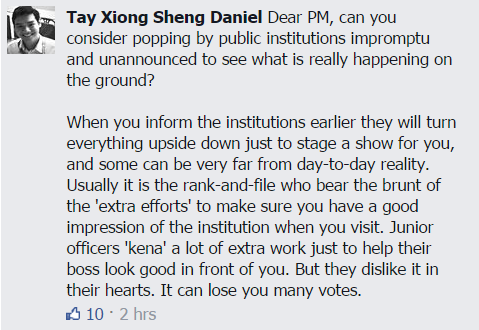 It now appears that even PAP's own grassroot members are unhappy with all these political wayang that they have put up. Tay said that "rank-and-file" bore the brunt of the work to impress political leaders. Is this a sign that PAP is losing support among their own grassroot activists? What do you think, Singaporeans?